If you have lost someone close to you and suffer with that loss, you may have wished for, prayed for, expected and or anticipated some sort of supernatural experience that would validate your belief that there truly is life after death. I believe that somehow our loved one who has moved on in spirit can communicate to us in some form or fashion, and that it can bring us a peace that can be found no other way. I believe we live in one sphere of existence, our departed loved one lives in another, but we can meet at the seam where our worlds connect. If our love is strong, and we keep all our senses open, it can and will happen; we need to let go of fear of the unknown and our own preconceived notions of what and what is not real. 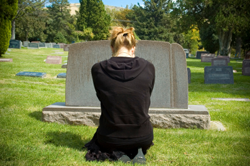 Most people have had some form of experience with communication from a loved one who has died. Many are afraid to tell others fearing that they will be labeled as nuts or gone off the deep end. I think for the most part, people are just still plain afraid of ghosts! Even the word ghost conjures up thoughts of scary things, so we use the words more palatable to our psyche, such as a presence, a spirit, an angel, a visitation, an entity, or energy field, verbiage that takes away the enigma of darkness that surrounds communication from spirit world. People are scared of things they do not understand and attribute phenomenon like this to some malevolent spirit instead of whispers of love from our loved one. Communications from beyond the grave brings to mind nineteenth century séances with unsettled spirits raising tables and blowing out candles, eerie, creepy and fraught with charlatans that prey on the vulnerable and the bereaved. Twentieth century Hollywood brought us many movies filled with ghost, specters and poltergeists that continue to haunt the lives of innocents. Spirit communications have been mystified and sensationalized for so long it has become ingrained in our collective psyche as a negative thing, when it merely love trying to shine through the veil of darkness. Some religions have also helped to perpetuate the urban legends of misanthropic entities that are bent on plaguing humankind. Some religious leaders teach that trying to connect with discarnate spirits as in using an Ouija board or a medium is dangerous, based on arcane/evil practices and one is investing in the dark side. Yet most religions are based on prophets who hear voices, have spoken with angels, and have communicated with people long dead. The concept of speaking with the dead goes back to ancient times and is not going away any too soon, because it happens and happens every day. Orbs in photos, lights turning and off, hearing voices, things being misplaced, a cool breeze from nowhere, doors slamming, phones ringing, dogs barking at nothing, the butterfly that does not go away, and on and on. Most people historically attribute these “happenings” to evil spirits or a poltergeist. That the life energies of the departed are somehow stuck on earth and unable to join our creator, they cling to the earth to haunt and to scare those left behind. Possibly it is just our loved one using what is available to let us know they are around us always. Spirit can even enter our dreams and speak to us in such a way that cannot be dismissed as “just a dream”. In the dream visitation, it is usually in full color; like watching a movie you can remember it vividly as the day it happened. You can experience smells, emotions, taste the tears, feel the pain and feel the love. Your mind, body and spirit react to is if it was real, you remember the experience as it if was real, you do so because it was not just a dream, it was real. My son has visited me in dreams and has given me a plethora of signs with the most significant being when I asked him to send me a sign a few months following his death. I asked him for a sign of something growing in our yard. Months later some cornstalks grew up in our lawn, and I let them grow and eventually one bore fruit bearing one ear of corn. When I inspected the ear of corn I found it was rotted and the mold had stained the back of the husk with one word: DAD. I asked Kelly to get back to me to let me know he survived death; he did so in a spectacular way that confirmed my belief that there is life after death, and I have no doubts on the validity of that experience. Our loved ones are with us always, so filter out the noise of life and speak to them from your heart and in prayer. Listen closely with all your senses, for love cannot be denied, it was and is always there…and only a whisper away.